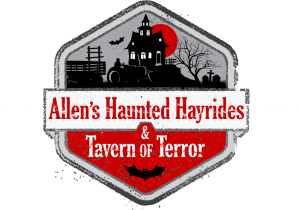 Allens Haunted Hayrides and Tavern of Terror is a Haunted Attraction located in Smock, PA. Team Houdini reviewed this Haunted Attraction on October 13, 2018. Allen’s Haunted Hayride and Tavern of Terror is the nation’s oldest hayride. Celebrating their 40th year, this family-run dairy farm started hayride hauling in the 1960’s by owner Ralph Allen, as a way to supplement the dairy farm’s income. In October of 1979, Ralph’s sons started the Haunted Hayride and the rest is history. Still family owned and operated today, it has three generations currently working. The haunted hayride provides a one-mile ride through the farm. The Tavern of Terror has over 3500 square feet of classic horrors. Besides the actors and props roaming the area, it is believed that the hay barn is truly haunted (psychics confirmed on KDKA in the 90’s). This is not just a haunted attraction but an event for the community and a haunt tradition for most. This family-friendly haunted attraction feels like a step back in time with a classic “old school vibe.” Don’t let that fool you as Allen’s does pack some scares and a lot of fun. On average, Allen’s usually holds around 70 ghosts, ghouls, monsters, and spirits. We encountered about 64 on our visit. The haunted hayride had about 48 characters while the Tavern provided around 16. Each scene felt like they had a good amount of actors. We saw a minimum of four per scene and as many as seven actors per scene raining terror on the hayride. A common theme in our reviews is that actors are like Jell-O, there is always room for more. The actors were mainly younger creatures who had a lot of energy and enthusiasm. The hayride featured some unique interaction with the cast that only younger bodies could perform; we will discuss this later. The hayride provided interesting scenes that got the audience involved. Actors perform the traditional jump scares, screams, and growls. The actors portrayed a variety of characters. The first individual, not technically an actor, was the owner and creator, Ron Allen. He was our driver and colorful commentator. He worked to get the crowd pumped up by provided introductions and small stories about the scenes. He also told us funny comments and observations. This was a different approach than other haunted hayrides and it helped break up the time between scenes and provided a distraction from the random attacks on the trailer. The haunt actors provided a variety of lively characters. A hillbilly caught a moonshine thief. While aiming his shotgun he gave the thief to the count of three to drop his moonshine. He needed our assistance to count past two before shooting the thief. A witch had a small girl in a cage. The witch was looking for more children. The poor girl in the cage screamed for our help and begged us not to go. They usually provide a current pop culture kid’s scene for laughs; this year was Fortnite. Two more hillbillies selling food and beer at the moonshine café talked with us about their menu. There was also a werewolf who would howl the more we howled. Another scene had a woman in a black dress at the gallows, accused of witchcraft. The reverend asked if she should be hung or not and the audience demanded she hang…so far we encouraged two murders…family friendly? We found some interesting oddities in the freak show. We encountered zombies, werewolves, witches, murderers, clowns, demons, scarecrows, Lucifer and Michael Myers. The Haunted Tavern had a mix of characters too. We were greeted by the barkeep who told us to “pick our poison” but we would end up like her or the brain-dead zombie shuffling along. Neither one looked like a good option as she appeared fairly dead herself. Mentally-disturbed patients screamed and banged around the mental institute. Disembodied hands popped out of the walls, trying to grab us. At the end of a long hall, the scared Rihanna (From Americas Got Talent) stared at us menacingly. The young girl did a great impression, attaining the same uneasy feeling that we had seen on TV. The Bride of Frankenstein violently asked us for help and a fortune teller discussed our futures with us. We also encountered some crazy carneys, woeful werewolves, a shocking scientist, and others that darted in and out so quickly we couldn’t catch what they were. From looking at some Facebook videos and pictures, it appears that there were about five or so characters we did not run into. The costumes were decent. Their get-ups were a mix of normal, dark clothing to help the actors hide in the woods and your typical store-bought costumes. The costumes fit the scenes and characters appropriately. The witches had black dresses and hats, werewolves wore jeans and torn shirts, clowns donned colorful clown costumes and Michael Myers adorned his traditional jumpsuit. The mental patients wore white coats with blood stains while the bride of Frankenstein had a pure white dress. Everything was very fitting to the scenes and characters. We didn’t notice anything that really stood out or provided any wow moments, though. Some of the costuming, masks, and makeup were difficult to see during the hayride as it was a very dark, moonless night. In the tavern, as stated previously, some characters popped in and out for a quick jump scare so we could not get a good view of their outfits either. Masks and makeup fell in the same category as fitting but nothing above the norm. Makeup consisted of bloody faces, dead zombies with dark eyes, pale skin, and clown make up which was used accordingly. The masks represented clowns, skulls, red demons, scarecrows, Michael Myers and more. The werewolf costumes were our favorite of the evening especially the chained wolf in the tavern. Allen’s Haunted Hayride is located off of Route 51. Entering Allen’s Haunted Hayride in Google or GPS will pull up the website and directions. We had no issues finding the location. A large sign sits on the grounds of the haunt with ample lighting. Parking is free. This is mainly an outdoor attraction. As it is on a farm, you will encounter uneven ground, some dark areas, grass, gravel, and possibly mud – nothing out of the ordinary for these types of events. Paying attention and walking at a normal pace should cause zero problems. The hayride is enclosed so it would be nearly impossible to fall off. The staff was great and friendly. Andrea and Danielle were wonderful, answering our questions and managing the bonfires available at an extra cost. They must be reserved and cost $30 per two-hour time slot. Ron was a great tour guide. The gentlemen assisting guests on and off the ride and the individuals managing the line at the Tavern were also super friendly and fun to talk with. After 40 years of haunting, they still enjoy the smiles and terror on their customer’s faces. The website is easy to find with a quick search. There is plenty of information about pricing, times, questions and history. Allen’s is a cash-only haunt with no ATM. The ticketing, food, bonfires, and games all require cash. Allen’s has an interesting atmosphere, “Its own personality” as Ron said. There are no line scares, no roamers in the waiting area, no real haunt related acknowledgments around. Outside of some horror-themed paintings on the tavern, the sounds of tractors and the distant screams from the Tavern and hayride, there is not much to prepare you for the haunts. It has a different energy as we sat at our bonfire and looked around. It was a calm, relaxing evening. Families were carrying in food and drinks and gathering around their bonfires. Country music played in the background. (Not haunt themed but in my opinion neither is that metal crap at every haunt) The event felt more like a fall festival than a haunt. Some games and food are offered but there was no other entertainment. You provide your own entertainment. Old fashioned perhaps, but after forty years, multiple generations are sharing in this tradition. Very few haunts or businesses can last this long today. The Allen family, their friends, and staff are very proud that they are a tradition for many families. When looking at the hillside at all the bonfires and families, the word that comes to mind is fun. Even though they lack the pre-scares and entertainment, it was nice to sit by the fire to relax and enjoy time together. For a smaller statured family haunt, the effects were done commendably. The sound is present throughout the hayride, not every scene has music but it is used as needed. As we entered the dark woods the first scene provided a guitar-heavy metal music as we were attacked. The clown area had clown music, the church and cemetery went with the classic organ music, Toccata and Fugue in D Minor (if you don’t know, Google it and after two notes you will get it). In the fortnight area, the characters were dancing to a pop/rap song. The road to the Lucifer played “Highway to Hell” which made sense. Good ole Michael Myers had his classic John Carpenter theme from the Halloween movie. The tavern had eerie background music and other sound effects including horns that were alerting of a countdown in the spaceship area. Lightning and electric effects added to the Frankenstein castle. Carnival music played in the carnival area. Owl noises and other ambient sounds filled other areas. “Devil Man” played near the end before the final scare. This is not the best use of sound we have experienced but it definitely added to the overall feel of the scenes! Everything at Allens has been created and designed by the staff and owners. Sharky is responsible for most of the sets in the haunt. The themes and sets found within are more of your typical constants found in haunted attractions. Although the scenes throughout have been seen before, they have put a great deal of detail into the scenes. The moonshiner had a little run down shack, with a makeshift distillery. The witch’s area had a realistic cage and table with a crystal ball and other paraphernalia. The ghost train was a cool design. Unlike other haunts where something pops out like it’s going to hit the tractor, this one sits up high and drives out of a tunnel onto a bridge and gives the illusion that the train is going to fall on top of the wagon. The clown area had a dancing clown in a box that waves and instantly vanishes. A little work could be done on the tombstones to add a little more realism. We really liked the Pepper’s ghost effect (I’m thinking it was used in Disney’s Haunted Mansion). Lucifer had a large thrown he sat upon with intricate designs painted or possibly carven in. Lucifer also had an awesome flaming pitchfork that was distinguishing. Unlike most haunts, they did have a final scare provided by Michael Myers. The Tavern provided a genuine bar from when this location was an actual bar. Real bottles of alcohol lined the cobwebbed shelves. Broken walls provided a rundown effect. The asylum’s white, ceramic-looking walls provided a cold, sad feeling. The hallways were decorated with average décor you would find at your local Halloween store. The spaceship area had a metal look with tubing and flashing lights to give an authentic feel. The carnival had an animal cage and midway games in your typical color scheme. The fortune teller’s booth looked as if it was pulled right from the circus! Strobe lights and fog added more effects as we traveled through the claustrophobic hallways. The highlight of this attraction was the Frankenstein castle scene. The stone walls confined the monster and his bride inside. Strobe lights provided the classic lightning effect. It felt that we had walked onto an old Frankenstein movie set. There was a small finish with a final cast member jump scare. He was so quick I did not catch what he said or what he had on. Although a step behind most haunts out there today that provide Hollywood-style sets and over the top animatronics, the effects worked well with what they used and they went with the farm. The Hayride and Tavern didn’t follow a specific theme. Instead, they are a melting pot of horror tropes. The owners are proud to say that this is a haunt that families can enjoy together. They do not have the gore of other haunts, they focus on traditional scares and effects. They want to scare and not terrorize younger members, but that doesn’t mean they won’t torture teens and older guests. While they’re not the scariest haunt, they did still provide a lot of scares and attempted scares. This is a good entry-level haunted attraction for newcomers or a reminder of how haunts used to be before the high-tech effects and thousand dollar props became more popular. The scares are reliant on their cast and the actors did a good job with that. The hayride is the only hayride I have seen that has six foot of piping on top of the wagon. It surrounds the sides and back, the top and the front remains open. Originally thinking it was for safety, it provides an interesting scare technique. As you move from scene to scene different characters will scare riders. They do this by banging objects off the bars causing jump scares. They also use these to jump onto the wagon, reaching at victims, growling, screaming or laughing. Some actually will hang upside down from the piping wrapping their legs around the pipes, to hang above the passengers. Some were quiet enough to be able to hang above our teammate without him noticing. Others pushed chainsaws through looking to decapitate someone. They did a good job of lining the perimeter of the ride leaving room in the middle unlike other hayrides this year. That provides an avenue for more creeps to get on board and evoke fear on the targeted. It is truly impressive and only young and able bodies could accomplish it. They also use the cage to rock the trailer, adding more uneasy feelings for passengers. No one is safe as the monsters do target everyone. The tavern was separating groups into smaller numbers which are always nice to get a better scare. This also gave them a better opportunity to scare each of us better and they did target all of us. The tavern relied on jump scares and some conversation to scare customers. Some basic animatronics were found but the actors provided the most scares. The usual screams, air blasts, and loud noises provided jump scares. Some interesting concepts included a hallway with holes that live hands popped out of. The actors in here were excellent at standing incredibly still. We walked past several thinking they were just props only for them to come alive and scare us. In my opinion, this scare is less and less common. It was more popular when I first started attending haunts in the 90’s but now it is more of a lost art. Overall, the cast provided a great show and some good jump scares. This proves that you don’t necessarily need blood and over-the-top violence and expensive props to scare people. The Haunted Hayride was very enjoyable with some good scares, interesting dialogue, a unique method of attack (the whole hanging upside down thing) and an enjoyable guide. After forty years he is still enthusiastic and interesting to listen to as you explore through the hayride. We clocked the hayride at 18 minutes. If you are just planning on the hayride, the cost is $15, which is 1.2 MPD (minuted of entertainment per dollar spent) which is a pretty good value! The Haunted Tavern provided detailed scenes with interesting characters and some good surprises. The Tavern clocked in at six minutes. The cost for the Tavern alone is also $15, putting it at a MPD of 0.4 which is quite a bit below average. A combo pass is available $25 for both attractions. The combo ticket option would provide a total haunt time of 24 minutes which is pretty average and brings their price to about ninety-six cents a minute for both attractions which is slightly under the median for this year. The haunted hayride has a good amount of content but we wouldn’t mind seeing some additional scenes. The Tavern does pack a lot of scenes and detail into a smaller area. I am pretty sure they have maxed out the available space with no wasted areas. Allen’s Haunted Hayride promotes family time and bonding. Considering they have all worked together on the dairy farm their whole lives and at the haunt for forty years, they know the importance of family. Allen’s may not have all the fancy technology of other haunts but it still can provide entertainment. It is a great entry-level haunt or one that may be appropriate for younger children. For older haunters, it is a step back in time. A look at what haunts were before commercialization. I believe that is why they are still around after forty years. They stick to tradition. We are hoping to make this a new yearly tradition for our team and hopefully my daughter in the near future.